While searching for some images for a previous post, I happened to come across this cartoon from February 2008. I doubt there are many today who would still suggest that the busway is a white elephant but the description of it as one back in 2008 doesn’t surprise me considering other major public transport infrastructure – like Britomart – also get similar labels but often turns out to be an outstanding successes. 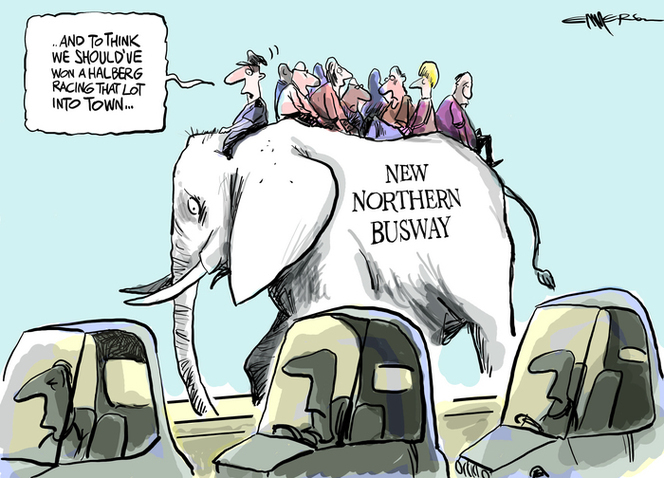 With the hindsight knowledge that the busway has been extremely successful I wanted to see what caused the cartoon to be created and it was in response to this article in which herald staff compared a car trip to a bus trip on the first day of operation on a route that hardly even used the busway. Auckland bus commuters soundly beaten to work by a Herald car on the Northern Busway’s first big morning can at least congratulate themselves on doing the right thing by the planet. The car’s coverage of 15.8km from Campbells Bay in 37 minutes compared with a tortuous 52-minute trip suffered by a colleague in a crowded bus that turned up 10 minutes late. This did not show the busway in a good light, even though only 2km of the bus route coincided with the new $300 million transit spine. The 6.2km two-lane highway reserved just for buses fared somewhat better for a hybrid trip by a third Herald journalist, who used its full length while covering a more indirect route of 18.6km in 41 minutes. That included a 4.7km leg by car to the Constellation Drive bus station, from where he caught a bus that did 13.9km in just 24 minutes down the uncluttered busway and across the harbour bridge. Now I’m pretty sure the driver from Campbells Bay would have been none other than John Roughan who has long bemoaned public transport even as recently as May this year suggesting that intensifying the city around public transport nodes is swimming against the tide because everyone wants to live on a beach-front property and drive everywhere. Back in 2007 before the busway opened he also suggested that the Northern Busway was unlikely to work but in the end was only good because it was a road and that meant it could be changed to allow cars to use it too (because if there’s one thing he hates more than PT it’s rail based PT). Interestingly in many of the articles and editorials I found the busway was often referred to as a bit of an experiment, perhaps the writers had little faith in the general public’s desire for real choice. While it is often mentioned how successful the busway has been, sometimes it’s hard to understand just how well it is performing. While searching I also found this parliamentary question from the month the busway opened which helps give an indication of that success. 1239 (2008). 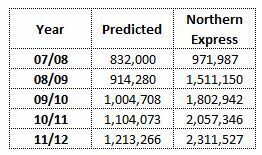 Dr Jonathan Coleman to the Minister of Transport (27 Feb 2008): What is the predicted volume of passengers on the North Shore Busway each year for the next five years? 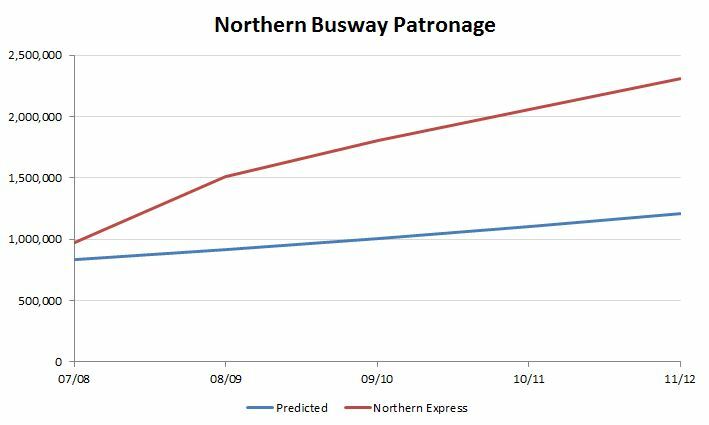 When we put compare those figures to the ones from Auckland Transport the difference is striking – and even more so when you realise that the AT numbers are only for the Northern Express which is estimated to account for less than 50% of all patronage along the busway. While the Northern Motorway is still busy, where the busway has had a massive impact has been in making bus trips much faster and more attractive. As a result more people are heading from the North Shore to the CBD in the morning peak by bus than by car – the number is 41% when comparing the percentage of all trips across the bridge during the peak. The one thing the busway is not is a white elephant, instead it’s a fantastic success and one we should try to replicate in other parts of the city. It does make me wonder if the Northcote Point residents ever regret opposing having a busway station in their suburb? Although with the way some of them act over the suggestion of even just a cycleway across the harbour I suspect the opposition would still be loud. You have to laugh at those Northcote Point Residents, every attempt to make their suburb a convenient short ride from the city by bike or bus are vehemently opposed. Even the Onewa HOV lanes get bad press at times over there. Maybe Northcote Point is a time capsule that was put in place in 1960? That is when most of the residents last appear to have been open to a new idea, that is for sure. Yes these little local associations, especially in the well off areas, are prone to capture by mean spirited time-rich NIMBY blowhards. Still chuckling though at the perfect witlessness betrayed by the moniker: NRA, Northcote Residents Association…. This is further proof that we do not have evidenced based transport decisions being made at any level in this country: Any rational government, central or local, and responsible agency would take the clear results from this ‘experiment’ and see that any widening of the North Western motorway must involve proper Class A bus amenity as its first aim. By every measure; economic and environmental, this is the most efficient way to improve that corridor. Yet what do we get? It’s not clear at this stage but a suboptimal incomplete Transit ROW seems most likely, and the opportunity to actively use buses to help make the reduced road space during construction function most efficiently has not been taken either. Why? Yes, that’s the frustrating thing. In any other field you would give yourself a pat on the back for the outstanding sucess, figure out which parts to tweak (dedicated lanes on the city side) and then look where to replicate that sucess elsewhere. In Auckland its almost as though there is active resistance to having PT any more successful than it has been. Is there any record of Roughan ever re-evaluating his opinion of the Busway in light of the now indisputable evidence of it’s success? Roughan’s a small town boy from Bluff, originally. His vision of paradise is a big villa, set in large grounds, near the sea; couple of big-engined car; a runabout for the little lady; lots of nearby motorways to speed in; and it would be great if you could parallel park up Queen Street. I suspect that like Joyce, Brownlee, English, et al, and most of the traffic engineers in the Ministry of Transport, he’s never lived a truly urban environment and, like most conservatives, can’t understand why anyone would want to question his opinions; ‘facts’ are pretty meaningless and once you’ve made a decision why worry about the consequences. These troglodytes are the people who run the country. Agree with SteveC and you’re not really going to get anywhere by insulting conservatives & traffic engineers. Anyway cities are generally large enough to have both the urban environments that you guys love as well as the suburban car based lifestyle that others (I would classify myself as one) want. The quantities of which can be determined pretty well by the market me thinks. Unfortunately our goven=rnment seems intent upon not allowing me my desired lifestyle. TBH most of the isthmus is pretty urban in my eyes, OK yes there are some car dominated areas (St Lukes for instance) but areas like Ponsonby, Newmarket, most of the arterials are quite walkable though admittedly very expensive. I’m not sure what is particularly desired in these areas. Do you want large condo developments or is it streetcar rails? Maybe urbanist boutiques? How about ways to get along Ponsonby Rd that doesn’t involve always giving way to cars? How about pedestrian crossings that aren’t pedestrian refuges, how about cycle lanes, how about a road that isn’t choked with traffic that’s just passing through? All of those things and small apartments without carparks which are illegal in Auckland. Can’t say I’ve ever had an issue getting around Ponsonby Road on foot, even crossing it is rather easy without even using a designated crossing. Newmarket is also rather easy to get around except for the fact the footpaths a so narrow, they really need to remove a few of those car parks that line the side of the street which really don’t need to be there given there is so much off-street parking in the area. SF Lauren, getting through Ponsonby on a bike is scary (and I would consider myself a confident rider). And while crossing as an ABLE-BODIED pedestrian isn’t too bad, I don’t think it has much pedestrian amenity. Peds are just squeezed to the narrow sides. Like Queen Street before the revamp, which at least restored a bit of balance. Presumably you are a fit, active individual. Having tried to get around Ponsonby on crutches, I can attest it is a challenge if you mobility is limited. I haven’t tried cycling along Ponsonby Road and I would agree with you that it would be far from ideal. I live and spend most of my city-bound time in and around the CBD and older suburbs and none of the main roads appeal to me for cycling even though I used to cycle all the time back in Hamilton. They are all just too narrow and carry too much traffic for my liking. In regards to being mobility impaired, you would be hard pressed to find a place that isn’t a challenge to get around. I found Queen Street and the shared spaces (the 2 that existed then) to be ok, everywhere else was prett challenging. Lots of overseas cities I have been to would have been ok though. I think Melbourne’s downtown would have been the best outside of Europe. How is a mobility impaired person meant to find Melbourne easy to get around with all its uneven footpaths, large kerbs and tram tracks cutting across the road. You almost need an ATV to get round there compared to Auckland. It’s better than Sydney mind you. Sydney was as bad as Auckland IMO, maybe worse. Melbourne was lovely, the traffic was slow, or forbidden on a lot of city streets. For example Flinders Street through town had a convenient crossing every 50m or so. Queen Street is about 100. For a start, yes, the market would be a good way to decide what people want. Unfortunately the highly restrictive exclusionary zoning rules (minimum heights, minimum set back, minimum parking, minimum lot size) in Auckland mean that the market cant operate properly. Developers who want to operate in a free market are forced to create developments and offer a product that a lot (not all, maybe not even the majority, but a lot) want. These are more urban, dense areas with a mix of residential and commercial. This is what big kid, grown up cities have. The Unitary Plan goes a long way to helping achieve this. However, many people who only understand and have only lived in the “suburban car based lifestyle” you like, refuse to let a slightly more free market operate and are determined to stop it. This despite the fact that housing in many of the suburbs they want to protect (Ponsonby, St Mary’s Bay, Freemans Bay) wouldnt comply with the current rules but would be allowed under the new Unitary Plan rules. Things like light rail will come as the density increases and people want to travel between the true urban areas. Just like they used to up until 1955. The heritagey bits of Ponsonby, St Mary’s Bay, Freemans Bay and so on wouldn’t be allowed under the UP rules either, since the lots are too small. The Unitary Plan only allows large-scale multi-unit developments, not houses on small lots. The UP also continues having rules for setbacks and maximum coverage rules that are well in excess of what was built in heritage areas. It’s better than the status quo, but there’s still a lot to be desired from our Unitary Plan. Outside the central city, the only zone that comes close to allowing a “free market” is the Commercial Mixed Use zone – no coverage, setback, parking or density rules, a reasonable 200sqm minimum lot size, and very little limit on land use. You will find that most traffic engineers are very much urbanised, and aware of other transport methods than the car. My office for example has a cycle share significantly higher than the average, by an order of magnitude. If you want to accuse the profession of traffic engineers of anything, then accuse us of willingly building what the politicians and the policymakers have decided (roads), and not falling on our swords in protest. No, our profession hasn’t done that. But it takes a few more particpants here to tango. Perhaps it is worthwhile to point out that only one bus anywhere near Campbell’s Bay actually uses the busway, and in that can it joins at the penultimate station and does most of its journey on local roads with no bus priority. It’s almost as if the picked the worst route on the north shore to compare. Actually they did have a full network redesign planned which basically rejigged everything on the shore to focus on a trunk and collector model to suit the busway. However when the started consulting they have every man and his dog up in arms about having their bus routes ‘destroyed’ and moaning about transfers and not having direct service to town. In the end they couldn’t get a suitable bus redesign over the line, so were left with having to try and run an new integrated busway network over the top of the entirety of the legacy network. Obviously that would have resulted in a huge amount of service delivery that they couldn’t afford, so the busway services got trimmed right back to just the NEX and a handful of now infrequent and ineffectual feeder loops. At least with the new RPTP network we will finally see a redesign of the shore network to really make the busway work. interesting Nick, I was on both the technical and political (in an advisory role) steering committees for both North Shore and Auckland City councils to late 2005 as well as working on the project and I don’t recall that being the case, what period are you referring to? I’m not sure exactly, that was before my time. What I wrote above is what was explained to me by a former ARTA planner, when I queried why there was such little service change following the introduction of the busway. One example used was the 839/858 875/879 pairs which were supposed to be terminated at Akoranga. This would have knocked about a third off the length of the round trip of each (that’s about 16km times four to eight runs an hour), and the saving used to run the 880 collector in to Constellation and Albany every ten minutes instead. I always got the feeling the Northern Pass was indicative of much larger plan for service integration. Otherwise, why would you bother when you just run a series of L shaped express routes and a Park n Ride/ Kiss n Ride based main line? God I wish they had rejigged those routes. 10minute frequencies on the 880 would be amazing. I feel there is more to explore between the 2 options. The 2 options being Feeders then an express OR feeders that continue along an expressway. Some previous discussion on the blog has shown feeders working well but the feeders are running thru Grid pattern areas. North Shores geography (hilly) means the next “parallel” street maybe more than a miles walk away. Hence I feel the peak time buses than run thru a suburb then use the Northern busway to get to town work better than using feeders and North express. Can any one refer me to more information on using feeder buses to supply a bus express network? Are there particular pages or chapters which refer to this? There are I think 3 chapters on network design. Should be evident from the contents page, you should read the whole book if you can, only takes about 3-4 hours at a moderate pace. I think AT really needs to advertise these kind of statistics to change people’s attitudes about public transport. How many Aucklanders would know that more than 50% of people crossing the bridge are in a bus? Not many I suspect. I’ve seen half page ads in the Central Leader publicising road disruptions due to eden park games, billboard ads from kiwirail telling people not to touch power lines, why not advertise something worthwhile for once! Well to be clear, it’s more than 50% of those going to the CBD. When comparing to all trips (i.e. shore to Penrose) it is 41% of all people crossing the bridge. One of the problems of course is the government love to pull out gross mode shares so they will compare patronage on buses and trains across the entire day and proclaim that PT doesn’t do much. What’s wrong with that? If you are talking about the transportation network of the city what is wrong with looking at what happens during 95% of the day rather than just the 5% being the morning 1 hour peak? Because its the 10% of the day (the measured morning peak in this article was 7-9am) when demand is at the peak and thus which determines the overall required capacity investment. I was more looking at the peak 1 hour as currently our PT network is very peaky with most of constrained demand getting through within a 1 hour period or less in the morning. Quite right that peak hour does drive the peak capacity requirement however peak time capacity is only one of the many aspects for which a transport system needs to take into account. Actually it’s not as peaky as you might think. In Auckland on a weekday approximately 40% of PT trips are during the four hours of the peaks (two hour AM and two hour PM), but 60% are during the remainder of the day. Yes but how many of those 40% of PT trips happen during a 1 hour period on any given route? For example if you take any PT link with a target arrival time of between 8:00am and 8:30am you will find people packed in like a bunch of 12 year old girls as a Justin Bieber concert, however simply wait half an hour and you will be traveling is spacious conditions, maybe you need to share a seat however it is unlikely you will be standing. For roads however, your local feeder streets will have very peaky conditions but the likes of the CMJ only some 7-8% of traffic passes through during peak hour. On a typical citybound commuter route in Auckland the busiest one hour period carries about 60% of the two hour AM peak. The PM the peak actually runs for about three an a half hours and is very even, basically a solid plateau from about half three through till seven. If you average across all the PT arriving in the city centre on a weekday, the busiest hour inbound in the morning (which is arriving between 7.30 and 8.30am) carries about 12% of daily patronage. Less if you average across the year including weekends and holidays. The peak 60 minutes of the AM peak is indeed very busy, about three times busier than the average, but it is only one hour out of eighteen hours of service. Less people are carried in the AM peak than the interpeak period, as an example, simply because the interpeak is six hour long and the AM peak only two. I would imagine that Fanshawe St and Nelson St are as peaky as the buses into town, if not the CMJ and the other parts of the motorway netowrk. Another factor to consider is that the peak crush only happens in one direction, the other direction isn’t really affected although there is still a reasonably amount of patronage going the other way. Get outside of peak times and you find that patronage is much more bidirectional so services can be carrying twice as much, relatively speaking, as it appears from glancing at the bus as it goes past. Yes having spent a month walking the length of Hobson to and from work I can confirm it is incredibly peaky. One thing I would love to have done is a comparison of the Northern Busway versus the Northern busway in the city side of sunny nook station. They are directly side by side so can quite easily count number of cars and people in a car and number of buses and perform a fairly accurate count of people on buses. . The best way to do this would be by videoing so the counts could be replayed in case anyone wanted a real check. Not sure about confidentiality issues here but would think driving on the motorway or being on a bus is public space so as individuals there is no issue. As the Northern network is being re-planned the commercial advantage of knowing the competitors occupancies for future planning is limited. I believe it could be a great headline for something like Campbell live- A Busway beating a motorway!! You will notice that those motorways in the CBD are busy between 7am and 7pm, so 12 hours of the day and no just 2 hours. You will also notice that during those 2 hours your refer to that the average speed is around 30km/h due to the road being over capacity. Customs, Fanshawe, Hobson, Nelson and Quay are presubaly the streets being mentioned here. If you actually spent time in the CBD you would know that they are only ever congested in the peak. Customs is modrately busy all day but has stable flows outside of the peak. Fanshawe Hobson and Nelson are all congested for approximately 1 hour, between 445 and 545 pm. Yes, those were excatly the streets I was referring to. I was told motorways so that’s what I went with. I was also told they were 4 lanes “to deal with capacity issues for just 2 hrs in the day”. Nobody said they were congested however if they are that would suggest they have inadequate capacity to handle their demand at peak time. I’m happy that they are unable to handle their peak demand as it puts a throttle on the number of vehicles in the CBD. FYI, I frequently need to take taxis to the CBD so I have a pretty good idea on how free vehicle movement is throughout the day. Most likely a better idea that what a pedestrian would have or someone traveling in a bus lane. For further reference, the reason I take a taxi and not the train is that I don’t want to spending 15mins walking to the train station with whatever material I need for the meeting I’m going to. Then you are lying as far as I am concerned. Capacity is never the issue. The rad design reduces speed with so many intersections, the roads are capable of through-putting the necessary number of vehicles outside of the peak, at a reasonable speed. Vehicle speed is constrained by geometry, not capacity, it isn’t congestion. Also, I am incredibly happy that they are a constraint at the peak, both for that reason, and because if they weren’t the city would be a less pleasant place to do anything other than driving. Also, I am of the opinion that roads in the CBD should be gridlocked at peak, anyone stupid enough to drive there deserves to be stationary IMO. So as far as I am concerned the roads are overbuilt to accomodate the throughput at the peak hour, as the roads manage the throughput, just at a much lower speed than desired. I disagree with the last point. Transport, both roads & rail are designed to service the peak and while I agree its impossible to remove congestion from roads, they shouldn’t be gridlocked at peak. Flowing at 1/3 of the speed limit would be acceptable in my eyes. But what you are trying to move through those roads – people or cars? There is a difference. Dedicated bus lanes would shift many more people at peak than cars. It might not make a scrapof difference to congestion – possibly make it worse if you took away a car lane – but you’d be getting more people using the roads. Its that or congestion charging to reduce the amount of cars trying to get into the CBD in the first place (after providing them with a RTN choice – see above). I choose to see road design from an entirely different perspective to you Frank which may be why we disagree. I look at a road, and its width and uses. Dedicate road space accordingly and simply do not car about the speed of vehicles. For me, speed of vehicles is my lowest priority. Ped amenity, cycle amenity, person throughput, place making, safety, permeability and access are all more important in my opinion. For example; I fully support a completely segregated busway along Fanshawe From the motorway all the way to the end of Customs, removing the Hobson St flyover, and widening the footpaths. It will make the roads more pleasant for pedestrians, increase throughput of people, increase the quality of place, increase safety, and make the network more permeable for peds and cyclists. It WILL slow vehicles, but that is the trade off. Have a street doing everything else well but that badly, or do that well and do everything else poorly like we do now. Sailor Boy, you do know that the current average speed in the CBD is in the range of 5km/h during peak hour don’t you? Outside of peak hour its more in the range of 35-40km/h even though the speed limit is 50km/h, this is due to the constraint of the intersections you mention. That peak time reduction is purely due to the road network being under capacity to provide for the demand that it has, and as we both agree the capacity within the CBD doesn’t need to be increased to satisfy this demand. Ok, we both agree that the capacity needn’t increase. But I think that the roads are already built to handle that capacity. The speed is irrelevant IMO capacity for me is throughput. I doubt you actually believe that statement, if you did then you would be quite happy with trains only running every 4 hours off peak or the bus down your street in Browns bay twice a day as that would be able to provide for the capacity required. I’m quite certain you wouldn’t be happy waiting 30mins just to cross the road at a set of traffic signals. In reality capacity is just one transport criteria with speed being another, along with reliability convenience, frequency, pleasantness and so on. No, because that is talking about infrastructure designed for movement, with place being far less relevant, downtown streets should prioritise place over movement.Rail tracks, motorways, and to a lesser extent arterials should focus more on movement and a little less on place. I think we have had this argument before though, we came to the conclusion that I ranked vehicle speed lowest on all downtown streets, you ranked it a little higher on some and that we agreed to disagree? Actually I was talking about the Auckland Transport Network and was not discussing the particulars of downtown streets. And your response that appears to be on topic. The particulars of certain city streets in isolation of the regional transport system is another topic. Then we are arguing about entirely different aspects of road design. This is boring. Endless re-litigation of who said what when will lead to comments being deleted. Desist. (a) separate service networks should have been designed, one focussing on the CBD via the busway, the other focussing on Takapuna proper? (b) this wasn’t done, for time and money reasons? The way it was explained to me: they did redesign the network to suit the busway and connect to Takapuna and other centres. That network required turning some routes that formerly ran into town into routes that terminated at busway stations, so that other routes could be boosted or added . There was public and political opposition to changing any routes so the network changes were shelved and they were forced to just add a small and fairly ineffectual set of busway routes over the top. So no, separate service networks should not have been designed, one network should have been deployed that was both effective and affordable, but it got thrown in the “too hard” basket politically. If you refer to a walk down the actual street you will notice that there is far less traffic on Flinders St, and that what there is moves far slower, so it becomes safe to cross much more often. Massive apologies here. Was talking about Swanston Street, really should have checked google maps first. You are entirely right about Flinders St. Was probably as bad as Hobson or Nelson, possibly worse. Apologies again. His fury about the efficient Swiss public transport was matched only by his monolingualism. Geneva has opened many more tram lines since the one line that was running then. It has also been converting its trolley bus routes to trams, and its diesel bus routes to trolley buses. John would hate all this. But so would GWRC and Infratil.